To where does one repair for lunch after drinking extremely rare, vintage champagnes all morning? Why, to a table for one at the very same Country Club Grill where he started quaffing the over-the-top wines at 10:00 am, of course! There, Chef Carlos Guia soothed our buzz with a Creole-crusted slices of yellowfin tuna with shaved vegetables over a sesame-ginger emulsion, followed by one of Vegas’ most definitive crab cakes served with a sauce ravigote (the name means “invigorate”), that is sort of like a remoulade with more serious intentions. Accompanying everything was what remains one of Vegas’ best bread baskets. Chefs may come and go at the Wynn/Encore, but the in-house bakery here still puts out some mighty toothsome carbohydrates. FYI: Guia is one of the coordinating chefs of this years TASTE OF THE NATION event being held next Thursday at the Rain Nightclub in the Palms Casino Resort. Tickets are $75, and the lineup of restaurants — from American Fish to Wazuzu — is plenty impressive and a mighty tasty way to fill your belly and assuage your conscience, while you’re helping fight the hunger that continues to grip our nation. “No Kid Hungry” is TOTN’s slogan, and by buying a ticket, you’ll be doing your small part to make sure some child in Nevada has enough to eat. Be there or be Three Square! 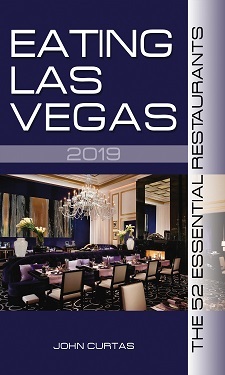 And yet another reason to buy a ticket to Taste of the Nation, aside from the chef star power and great cause: The authors of Eating Las Vegas: The 50 Essential Restaurants will be there to sign copies of their book!